This relates to the attempt to illegally withdraw toll tax exemption to serving defence personnel recently discussed on this blog on 06 August 2014. A distorted version of a letter endorsed by me to the Minister of Road Transport & Highways on the said subject is doing the rounds on social media. For the sake of transparency, and to put the issue in the correct perspective, the complete letter is reproduced below. Hope this clarifies all doubts on the subject. 1. The current Government is known to be inclined towards the betterment of the armed forces and looking after their needs and requirements. It is indeed satisfying that the Prime Minister has made his sensitivity known publicly towards the issues related to the men and women in uniform. 2. Unknown to you however, your Ministry has recently issued a letter (OM No H-24030/32/2014-(Toll) dated 17 June 2014) in the garb of a clarification under the RTI Act whereby an attempt has been made to nullify and withdraw the exemption from toll tax available to ‘on duty’ and ‘off duty’ serving personnel of the defence services under the provisions of the Indian Tolls (Army & Air Force) Act, 1901 and various notifications and letters/OM issued on the subject from time to time and also decisions of Hon’ble Constitutional Courts. 3. What is more surprising is that the letter has been issued on the basis of an incorrect and patently wrong legal advice by a junior level staffer of the Department of Legal Affairs of the Ministry of Law & Justice (MoLJ) whereas the same aspect had been clarified and approved at Secretary level of both your Ministry as well as MoLJ in the past. It is also not understood as to how an attempt could be made to nullify an existing dispensation and that too in an ambiguous manner by way of a letter dealing with an RTI query. 4. A detailed letter on the subject highlighting the correct legal position under law addressed by the undersigned to the Secretary of your Ministry as well as Secretary Department of Legal Affairs, MoLJ is enclosed herewith for your immediate necessary action. 5. Needless to state, it is requested that OM dated 17 June 2014 may be immediately withdrawn since the same is not only based on incorrect legal and factual appreciation of the Indian Tolls (Army & Air) Force Act, 1901, but is also in direct contravention of the notifications, letters and clarifications issued by the MoRTH in conjunction with MoLJ and law as affirmed by the Hon’ble Supreme Court of India. Toll exemption to defence personnel is available not by way of benevolence or a welfare measure but flows from a legislative Act which in turn was incepted to cater to the frequent movement of members of the forces and their families all over the country. It is also sincerely hoped that your officers keep the Minister in loop in the future before issuing any such letter which may have the effect of negatively altering public policy or the morale of the armed forces. 1. This has reference to OM No H-24030/32/2014-(Toll) dated 17 June 2014 issued by the Ministry of Road Transport & Highways (MoRTH) based on Legal Advice No FTS-48/JS&LA(SKM)/2014 dated 06 June 2014 tendered by an Assistant Legal Adviser of the Department of Legal Affairs (DoLA), Ministry of Law & Justice (MoLJ) vide which a clarification has been issued ostensibly in the garb of some reply to an RTI query vide which it has been stated in a roundabout manner that personnel of the defence services are not entitled to toll exemption when not ‘on duty’. 3. The above correct legal position was also amplified vide MoRTH Letter No NH-11065/12/2003-P&M dated 15 Sept 04 to National Highways Authority of India (NHAI) vide paragraph 1 of which it was clearly stated that private vehicles of defence personnel shall be exempted. The subject line of the letter also shows that all categories of exemption under Section 3 of the Indian Tolls (Army & Air Force) Act, 1901, would fall under the definition of ‘defence vehicles’ which is an exemption term usually used on National Highways. 4. However, the latest MoRTH OM dated 17 June 2014 (See Appendix B) has been issued on the basis of advice tendered by a Assistant Legal Adviser of DoLA/MoLJ (See Appendix C). In Para (c) of the legal advice rendered by the Assistant Legal Adviser in which Sections 3(b) and 3(c) of the Act are taken note of, it is stated by him that “the main focus in Sections 3(b) and (c) is on the word ‘Duty’ ”. Moreover, in Para (b) of the said legal advice, it is stated that Sections 3(g) and 3(h) of the Act indicate the usage of private vehicles for official purposes or duty only. Unfortunately, the appreciation of the Assistant Legal Adviser is not only legally, but also factually wrong and falls foul of even a literal interpretation of the Act and its provisions, and also of earlier clarifications issued by the Ministry of Law & Justice and the MoRTH which have been affirmed even by the Highest Court of the land. 6. It is also a matter of deep concern that the issue had earlier been examined by the Ministry of Law & Justice with file notings that were approved by the Secretary of the Department but still the Assistant Legal Adviser has opted to render a diametrically opposite opinion and that too after surprisingly endorsing in Para (a) of his advice that the earlier opinion was correct. It is a cause of greater concern that the file while moving upwards has not been apparently examined in light of the substantive law, that is, the Act itself and it has not even been appreciated by any senior authority in the Law Ministry or the MoRTH that the entire legal advice does not even refer to Section 3(a) of the Act which forms the bedrock of exemption to serving personnel of the regular forces. 7. It is also brought to your knowledge that provisions of Toll exemption and exemption to ‘off duty’ and ‘on duty’ defence personnel were challenged before the Hon’ble Punjab & Haryana High Court in Civil Writ Petition No 8508 of 2006. The Petition was however dismissed by a Division Bench of the Hon’ble High Court which held that the Act itself provided for concessions to defence personnel. The order of the Hon’ble High Court in the Hon’ble Supreme Court by way of Special Leave Petition 15419 of 2006 however the order of the Hon’ble High Court and toll exemption to “on duty” and “off duty” personnel of regular forces was affirmed by the Hon’ble Supreme Court. 8. 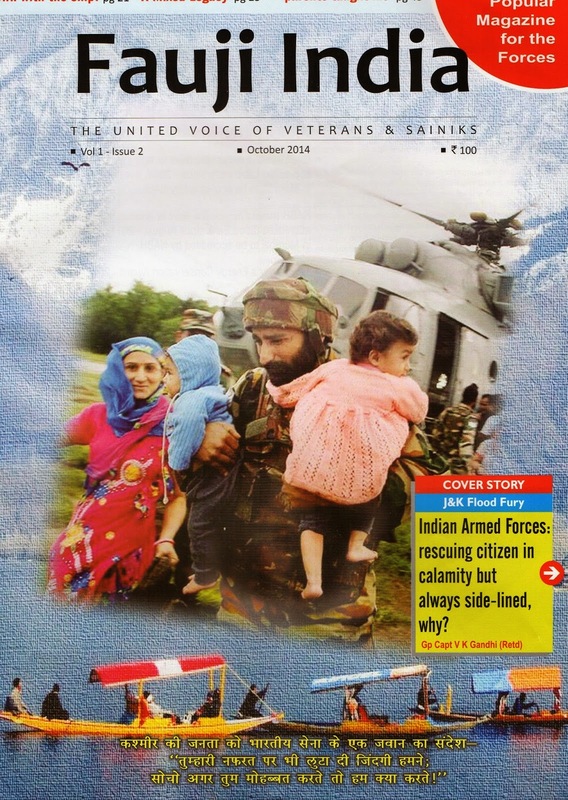 It must also be placed on record that such issues which affect the morale of the rank and file of the Armed Forces should not be dealt with in a cavalier manner and neither should Govt policy be allowed to be so fickle so as to change with the personal opinions of officers that too by overriding earlier letters, opinions, notifications, judgements of Constitutional Courts and even substantive legislative provisions. In fact it surpasses logic as to how could OM dated 17 June 2014 be issued ostensibly in the garb of a clarification under the RTI Act which has had the effect of overriding the earlier legal position solidified by letters and notifications which still have the authority of law and which derive their force from a substantive provision of law which has not been amended? 9. In view of the above, you are requested to kindly withdraw the legal advice rendered by the concerned Assistant Legal Adviser and also the OM dated 17 June 2014 immediately since the same is not only based on incorrect legal and factual appreciation of the Indian Tolls (Army & Air) Force Act, 1901, but is also in direct contravention of the notifications, letters and clarifications issued by the MoRTH in conjunction with MoLJ and law as affirmed by the Hon’ble Supreme Court of India. It is also requested that meticulous perusal may be initiated in a democratic manner at the highest level before issuing such letters which may result in altering existing Government policy and may have a large impact on the rights, benefits and privileges of a particular section of the society. 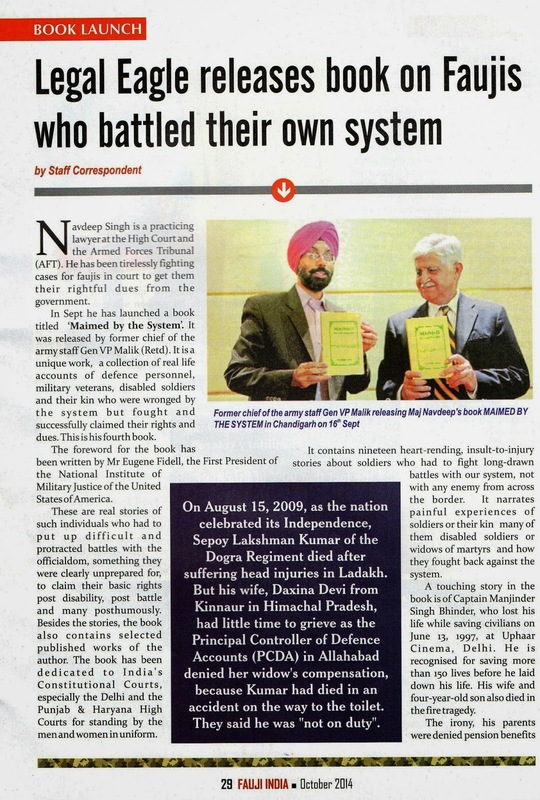 Fauji India Magazine has published a detailed review of my book “Maimed by the System” which is placed below. The Amazon India link for an easy purchase process (recommended) with free home delivery can be accessed by clicking here. In the long and tortuous journey for doctors working under the Central Govt, the Department of Pension and Pensioners’ Welfare (DoPPW) has today finally implemented the decision of the Supreme Court which had held in November 2013 that the Govt was wrong in its interpretation of addition of Non-Practicing Allowance (NPA) into total pensionary benefits. It may be recalled that earlier the Supreme Court had ruled against the claims of the doctors in BJ Akkara’s case but later when the Apex Court was informed about the correct position on the subject and that the Govt had chosen to hide the actual facts from the Supreme Court as also the very important point that even the Prime Minister had approved a policy favouring addition of NPA into the pension of pre-96 retiree doctors, the Court finally ruled in favour of doctors and recorded in its order the unethical stand of the Govt in this regard before the Supreme Court in BJ Akkara’s case. The subject in detail can be understood by perusing an old post on this blog dated 30 Nov 2013. The Govt had filed a review petition before the Supreme Court which was dismissed in July 2014. Taking a progressive and balanced view of the matter, the DoPPW has finally issued orders implementing the decision of the Supreme Court across the board universally and not just for the petitioners in the case before the Supreme Court as is usually done by the Department of Ex-Servicemen Welfare in cases of military pensioners. With this, the Govt would have to release the correct deserved pension to all Central Govt doctors w.e.f 01-01-1996 with all consequential benefits by including the element of NPA into the revised scales for calculating pension. The letter issued today can be downloaded by clicking here. Another post of 08 January 2014 that is linked to the issue can be accessed here. As reported by the Global Military Justice Reform Blog, the Colombian High Court (the Apex Court of Colombia) has rendered a landmark decision wherein it has ruled that disabled soldiers cannot be summarily discharged from the military on the grounds of unfitness unless such an exercise is undertaken in an objective and fair manner with recorded reasons. The Court has also held that such soldiers should be retained in administrative jobs. 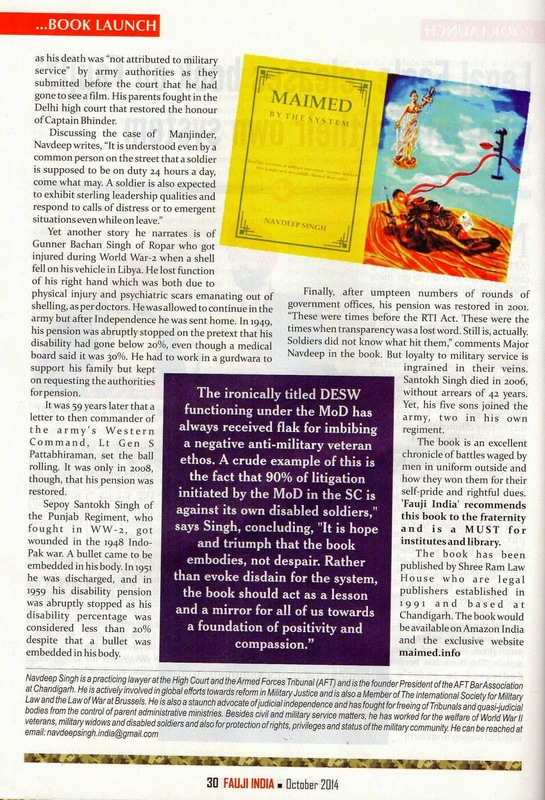 This is reflective of a landmark decision of the Delhi High Court, which, following a Supreme Court decision, had ordered the reinstatement (with full backwages and consequential benefits) of thousands of soldiers summarily discharged from service on medical grounds by the Army HQ in 2007. The stark discrimination between civilian employees and military personnel in this regard, not only related to protection of service but also to pensionary benefits, has been discussed on this blog before. Long live the Constitutional Courts! The Govt of India has progressively dealt a blow to yet another bastion of harassment. The requirement of submitting Boarding Passes for settlement of TA Claims has been abrogated by the Department of Personnel and Training (DoPT). Though the Ministry of Defence is not as proactive as the DoPT, the same dispensation shall be made applicable to military staff mutatis mutandis. The Department of Personnel and Training as well as the Department of Pension and Pensioners’ Welfare have time and again displayed utmost sensitivity towards the problems of employees and pensioners. Genuine proposals are given due thought and are not rejected summarily. The officers manning important positions are open to suggestions and are always available for interaction and across the table discussions. In fact, to be military specific, there have been instances when the said departments have taken a stand against the Ministry of Defence and the Army HQ in favour of military pensioners and disabled personnel reminding the system about proper appreciation and interpretation of policy. It would definitely be in the fitness of things for other Ministries and Departments to imbibe the spirit of positivity set into motion by these two departments.